Home » News » News » The VHI Women’s Mini Marathon is this weekend! 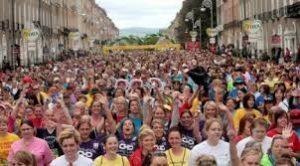 The VHI Women’s Mini Marathon which is taking place in Dublin on Sunday 3rd June is finally upon us. Thousands of women will register and start getting into the spirit of this fantastic women’s event. It’s always a fun day with everyone in great spirits. But whether you’re walking, jogging or running you must prepare your body for the 10K that lies ahead. A good warm up will improve performance and reduce the likelihood of injury. Walk– It is not a good idea to start stretching when your muscle aren’t warmed up, so start by going for a brisk walk with long strides or by going for a gentle run/ jog, no longer than 10 minutes though, you don’t want to tire yourself before the main event. Include Dynamic Stretching– This form of stretching is thought to be superior to static stretching as it helps increase performance by applying movements that use momentum to push your muscles through a range of motion. Examples of this are forward lunges, lateral squats and high knees before running is another good example. Swing into action– Your muscles and joints are like elastic bands. If you warm them up they’ll be resilient, responsive and flexible. Examples are arm circles and forward back leg swings, ten on each leg is sufficient. Stretchyour neck, lower back, calves, quads, hamstrings and groin area. Hold each stretch for 15 – 30 seconds.